"Songs are full of unexpected melodic tricks and rhythm changes." "There’s a maturity to the band’s music now"
"With Solid States, the Posies mark dramatic changes in the lives, the music, the evolution of the band." "A conscious effort to make a different Posies record." "With three decades of consistent creativity fueling them, the power pop combo serves up another solid gem." "By adding new colors and textures to their sonic palette, Solid States yields unexpected pleasures." "The album is stuffed with chiming, memorable melodies, and the duo’s magical vocal blend. " 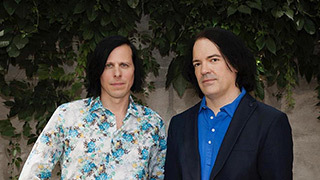 "'Solid States' is a triumph and testimony to The Posies' greatness "
"It's a glorious affair and overall the sound is more varied than recent releases." "Solid States merely reminds you of what a great band this Seattle outfit are"
"Solid States might not change anything in any significant way but the world seems a slightly better place for knowing that this exists." "There are special moments where diverse styles are incorporated "